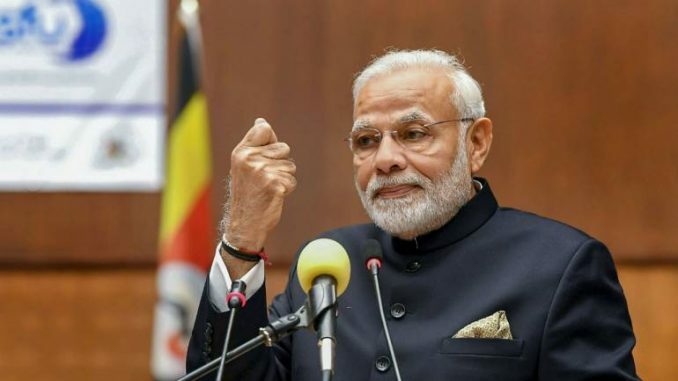 Jujwa (Guj): Prime Minister Narendra Modi on Thursday said every paisa of every rupee released by his government reaches the poor as there is no place for middlemen and asserted that his endeavour is to provide every Indian family a home of its own by 2022. Addressing a public gathering in this Gujarat village after a collective ‘e-gruha pravesh’ (online house warming) event for beneficiaries of the Prime Minister’s Housing Scheme for Rural areas, Modi said people now do not have to pay bribes to avail benefits of the Centre’s flagship housing scheme. Modi said he dreams of every family owning a house of its own by 2022 when the nation will celebrate 75 years of Independence. The erstwhile rural housing scheme, Indira Awaas Yojana was restructured into Pradhan Mantri Awas Yojana-Gramin (PMAY-G), which was launched by Modi in November 2016. As part of the government’s ‘Housing for All by 2022’ scheme, targets have been set to complete one crore new pucca houses in rural areas by March 2019 and 2.95 crore by 2022. According to information available on the Rural Development Ministry website, 18.22 lakh houses were completed under the erstwhile scheme in 2015-16, while the number rose to over 32 lakh in 2016-17 and 44.54 lakh in 2017-18 after taking into account houses built under the new scheme and completion of incomplete houses started under the previous scheme.